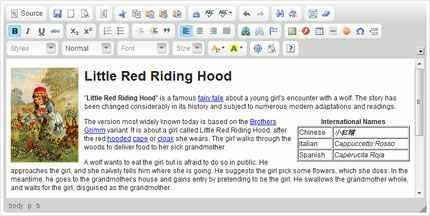 What is a WYSIWYG HTML editor? Many editors take things further, allowing you to upload images, Flash movies and other files to the Web server, and browse files on the server. Even if you’re familiar with HTML, you’ll probably find it quicker to enter and format text using a WYSIWYG editor than hand-coding your HTML markup and CSS. Both editors are free to use, and very feature-rich. Both are excellent choices, and there isn’t much to separate the two these days. The older FCKeditor was harder to work with and produced messier HTML than TinyMCE, but CKEditor is much better in these respects. You can try out the live demos of CKEditor and TinyMCE and see which you prefer. The next sections briefly explain how to install and use CKEditor and TinyMCE. Download the CKEditor code from the download page, then extract the .zip or .tar.gz file to a ckeditor folder on your hard drive. Now move the ckeditor folder into your website folder. Open the HTML page or template containing the Web form that you want to use with CKEditor. This form should contain a textarea element. adjusting the path to your ckeditor.js file if required. where fieldname is the name or ID of your textarea field. This should be placed after your textarea field in the markup. Alternatively, you can place it in the head element, or as an onload event handler on the body element. When the form is submitted in the above example, CKEditor converts the user-entered content into HTML and stores it in the articleContent field. This field is then sent to a server-side PHP script (form_handler.php) along with any other fields in the form. form_handler.php would then process the content as needed (probably storing it in a database). When the user next wants to edit the article, the server-side script would retrieve the article content from the database and insert it between the <textarea> and </textarea> tags for editing. 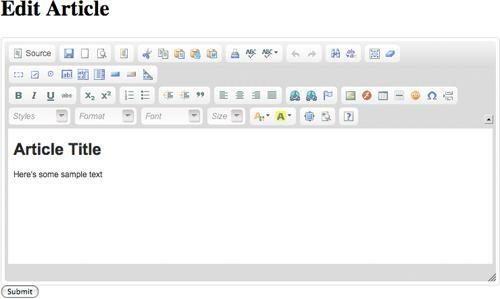 CKEditor will then display the content in WYSIWYG format so that the user can edit it. Make sure your server-side script encodes HTML entities in the content inside the <textarea> / </textarea> tags. For example, < should be encoded as < and > should be encoded as >. You can see that it’s very easy to get a basic CKEditor WYSIWYG field up and running. Next, you’ll probably want to configure the editor to add/remove options from the toolbar, alter the options in the Styles drop-down menu, tweak the HTML produced by the editor, and so on. Find out more on the CKSource documentation site. Download the main TinyMCE package, then extract the .zip file to a tinymce folder on your hard drive. Inside the tinymce folder you’ll find a jscripts folder containing a tiny_mce folder. Move this tiny_mce folder to your website folder. To make your form work with TinyMCE, you include the tiny_mce.js file in the page containing the form. This file is inside the tiny_mce folder you moved into your website folder. adjusting the path to your tiny_mce folder if required. As with CKEditor, when the form is submitted the content is sent to the server as HTML. TinyMCE is very flexible and easy to customize. Check out the list of configuration options, as well as the wide range of bundled plugins. For more info see the TinyMCE documentation. You can easily make your web project much more attractive for your customers and visitors by implementing the Redactor as your default text-editor. You can upload files and images using drag-n-drop, set up autosave, develop your own plugins and extensions. If your Redactor download is placed in a different folder, don’t forget to change file’s paths. This code may also be placed between the <head></head> tags or at any other place on the page. Finally, you need to place a <textarea> element with ID “redactor_content” (or with the ID that you set during Redactor’s call). This element will be replaced by the visual representation of the Redactor. Be careful: if you want the editor’s area to be the same height as the <textarea> itself, set the proper height. This is shown in the example above. I do every thing again and again what you do but i can’t show the editing menu, show the simple form only. I try with ckeditor and redactor but same thing happen. Now what can i do ? Please help me. Only edit this header code. How do i get this work out on Laravel.